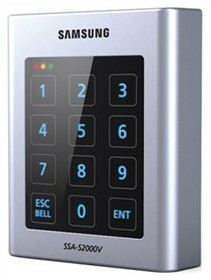 The Samsung SSA-S2000V is a standalone controller and 125KHz proximity and PIN access controller that can be programmed for up to 512 users and has direct control of door locks. It has all I/Os and operation time programmable by keypad with 5 independent inputs and 4 form C outputs. Power fail safe, Weatherproof alongwith Keypad locks make it ready for for challenging environments. The Samsung SSA-S2000V has many exciting features for users of all types. The Samsung SSA-S2000V is sold as a Brand New Unopened Item.